Whether to stay in a hotel or rent an apartment are a couple of choices you will have for lodging when taking a trip to Italy. 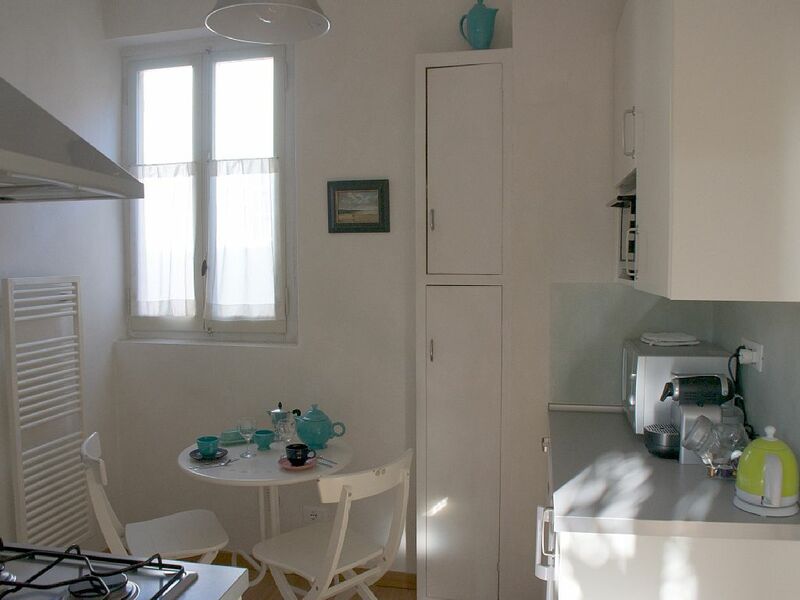 If you prefer to be able to make some of your own meals and live in an Italian neighborhood, renting a self-catering apartment could be for you. Each time we have gone to Italy since 2011, we have rented an apartment. 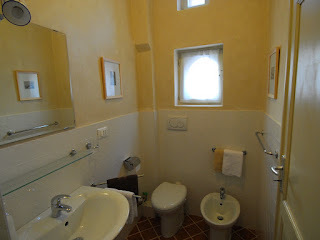 I have described the apartments in Florence and Riomaggiore in previous posts. Preparing for our trip in November 2015, I searched Flipkey for an apartment in Bologna. 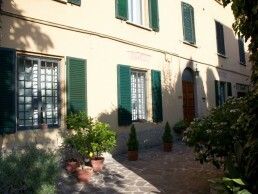 After reading the reviews, viewing photos and checking the location, we picked the "Bologna flat with green courtyard." Debbie and I were both happy that I did. The apartment (also now on airbnb UK with great photos) turned out to be perfect for us. While the apartment is a one bedroom, there is a sofa bed in the living room that would be perfect for children. Being somewhere outside the city center in an Italian family neighborhood was important to us and this apartment fit the bill. My photo of a Bologna portico on Saragozza with dog waiting. Debbie relaxing at the apartment in Bologna. 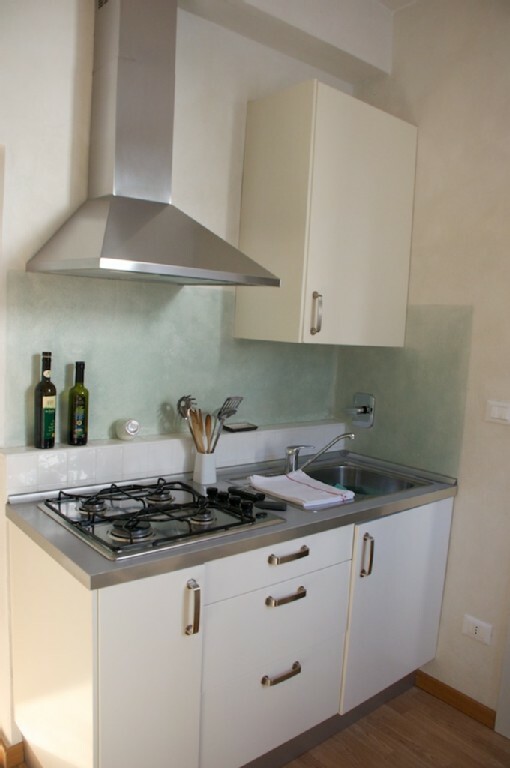 "This was perfect and cozy apartment for our first visit to Bologna. The owner, Michelle, met us at the door with a warm welcome and a big smile. She spoke English very well to counter our beginner's Italian. Michelle had stocked the kitchen with all the essentials for breakfast: yogurt, butter, jam, bread, orange juice, milk, bottled water, coffee and a delicious pastry tart. The spotlessly clean flat was perfect for the two of us. We loved it the minute we walked in. We are in our mid to late 60s and don't mind walking, and chose the location outside the city center for that reason. Our walk to Piazza Maggiore in the city center, almost all under beautiful Bologna porticos, took 15 to 20 minutes. Since we were there in mid-November, we did a bit of walking to the city center and back after dark and always felt very safe. If walking isn't for you (and you don't have a car) there is a bus stop just steps from the apartment door. There is a supermarket, IN'S Mercato Spa about 3/10 of a mile down the street (Saragozza) - very convenient for all grocery needs, including wine. We loved staying in a truly Italian neighborhood. Michelle has prepared an extensive guide to Bologna suggesting sights to see, restaurants and just about anything else you might need to know to make your stay a great one. She also arranged for our taxi to the train station for out train to Florence. Debbie and I highly recommend "Casa Corsica," the Bologna flat with green courtyard." Living room and bedroom to the left (owner's photo). Courtyard and entrance (owner's photo). "A charming self-contained flat, which has been recently renovated, situated in a typical bolognaise building of the late nineteen century. It is at the end of a private street, four hundred meters from Porta Saragozza and twenty minutes walk from Piazza Maggiore. The flat is on the first floor and is composed of a double-bedroom, a sitting room with a sofa-bed (king-size bed or 2 single beds)), an equipped kitchen and a bath with a shower. 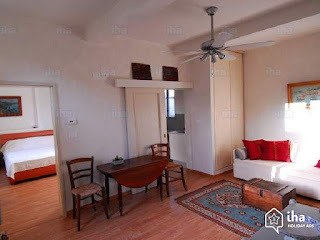 There is free internet and wifi connection, fans on the ceiling and italian tv. We live in the apartment above. The flat is near grocery stores, restaurants, public gardens and bus-stops. 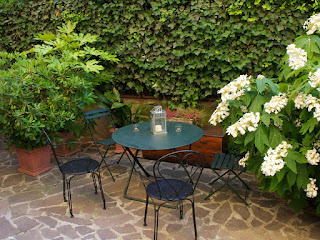 During the summer you can relax or have a drink in the charming internal court yard after having visited the town." Up coming posts will include tips on buying train tickets before you leave home, traveling by train, sights to see and how to react to panhandlers (beggars) you might encounter. I can't wait to visit. It is a work in progress but it will happen, and I will always chat with you before I plan anything - I will never forget our first trip to Firenze. You made it so much easier for us. Hi happytowrite, thanks for your kind words. I, too, have enjoyed our conversations. Because it is a work in progress, it will happen!